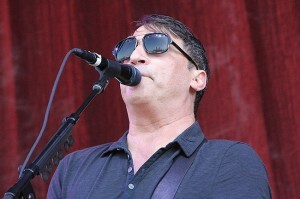 Since reuniting eight months ago, The Afghan Whigs have been on a roll. The band played a well-received set earlier this month at Lollapalooza that was followed by a sold-out show at Chicago’s Metro. The guys have just returned from a European tour and plan to hit the States hard this fall. Frontman Greg Dulli recently spoke to us about the reasons behind the reunion and what the future may or may not hold for the indie rock band famous for blending soulful vocals with post-punk rock. We’re writing a feature on the band for a weekly but won’t be able to use our entire interview with Dulli, who spoke via phone from his Los Angeles home, so we thought we’d publish it here. You always said that the band would never get back together. What changed? I received a request from a higher power, and I answered the call. Such is my duty as a servant of the Lord. You’re telling me there’s no real answer. It was a series of circumstances. It’s not like any kind of “wow.” It was just a bunch of things happened in perfect storm style. It all happened about eight months ago when it started to coalesce. What material have you been playing? The first shows we did played mostly the last three albums. We played a couple of songs off Congregation and we started to expand the Congregation sound and toward the end at Metro, we pulled out one from Up in It. When we got to Prague, we pulled out another from Up in It. We have five albums to pick from and that’s about 50 or 60 songs. We’re getting around to them. It’s a work in progress. Some of the guys are in Cincinnati? [Bassist] John [Curley] lives in Cincinnati. He never left. I live in L.A. part of the year in New Orleans the other part of the year, and I go back and forth between the two. Do you have aspirations for a new album or songs? I’m living in the moment right now and trying not to think too far ahead. That’s gotten me in trouble in the past. I try to stay out of trouble. If it turns out that’s the right thing to do, then I’m sure I will arrive at the conclusion at the appropriate time. Talk about the band’s formation. We met just knowing people. John knew [guitarist] Rick [McCollum] and I knew a friend of John’s. My best friend ended up marrying John. We have known each other since we were 20 or 21 years old. It was the three of us and we went through a couple drummers and then we had a Spinal Tap series of drummers which continues proudly to this day. We just started to write songs together and play gigs. Did you have an affinity for the bands on Sup Pop when you signed to the label in 1989? I liked them. I had heard Soundgarden first. Then, I heard Mudhoney. Then, I heard Tad. Then, I heard the Fluid. Nirvana was the last one. I liked them all. They were cool bands. They all put on great shows. When those bands would come through Cincinnati, they would stay at our house. Tad stayed at our house and Nirvana stayed at our house. They’re part of a great community of like-minded people. Did fans think of you as a Seattle band? We had toured in America before we got signed. The Flaming Lips used to take us around and they took us all over. We played San Francisco before we got signed to Sub Pop. When we first went to Europe, I’m sure people assumed we were from Seattle so we started playing weird cover songs. We got weird quick. The English grabbed onto the outsider status first. We were the red-headed stepchild and I always liked being the new kid in school. You didn’t know what I was going to do. My expectations were my own and not yours to have on me. Who introduced you to the Temptations? My mom was 17 when I was born. She listened to Motown in the ’60s. By the time I was five, she was 22 and still listening to young people music. Being introduced to that and being a curious fellow, I started to seek out other stuff. I loved music really quickly. The older kids in my neighborhood turned me onto Zeppelin and the Stones and AC/DC. I heard Patti Smith and by that time I was reading Creem. I was started to listen to New York-y stuff. I worked backwards to the Velvet Underground and all that. My grandparents listened to country music. I was pack-ratting a whole lot of styles. What was Cincinnati like at the time? What there was in Cincinnati was not in Cincinnati. It was in Newport and there was the Jockey Club. That’s where the Whigs played our first gig. I saw the Damned, the Vibrators, the Ramones, Husker Du, Violent Femmes, the Replacements, Johnny Thunders and Bad Brains. That was where everyone on that circuit came. The guys putting on the shows there, were responsible for keeping us on the cultural map. They influenced me more than they’ll ever know just with their daring booking schemes and going broke in the process by bringing unknown bands to a largely conservative area. You have a very soulful vocal delivery. How has your voice developed? I think I’m singing the best I ever have right now because I haven’t smoked a cigarette in four years. Not smoking has really helped me. All I was ever trying to do was emulate my heroes and do my best version of something I heard somebody else do. I shot really high and more often than not fell horribly short from the mark. My ambition outran me often but I have made peace with my ambition and can meet it on level ground. When you signed to Elektra, you issued Gentleman. Do you think of it as your best album? I think it’s a good record. I think Black Love is a good record. I think Congregation is a good record. They’re all good records. Gentlemen struck a chord in people. It did in me when I wrote it. Better than the others, no. Absolutely not. Talk about your various side projects and what was fulfilling about them. I started the Twilight Singers when I was still in the Whigs. I was exploring electronic music. When the Whigs collapsed, I didn’t play music for a couple of years. When I restarted it, I started to merge what I liked about electronic music with what I liked about rock music and pushed them together. The record I made with [singer] Mark [Lanegan] was a long gestating project and when we got on the same page and started to wrote together, that was my favorite things I have ever done to work with a friend as good as Mark is and an amazing songwriting. It was probably the easiest collaborative effort. He’s one of my favorite singers. Those things were all great. I played in this Italian band called Afterhours for a year in 2005. I actually moved to Italy and I was gone for a year. I wrote songs with them but I did not have to be the dude. I really liked being the side guy. I still smoked cigarettes so I could get my Keith Richards on and play guitar and sing back-ups, in Italian by way. Manuel [Agnelli] the singer made the set list and he was the boss. I loved not being the boss. So have you fulfilled all your contractual obligations for future albums? I do what I want when I want. I’ve set my life up like that. I do what I want to. I have no obligations whatsoever. I do things on a record-by-record basis. I’m a free agent. If you got an idea for me, throw it out there for me and I’ll check it out. I’ve got a comment for you, Greg. Don’t stop whatever you do. Give it as you feel it.